Full name: Philip David Collins. Birthplace: Partington, nr. Manchester, UK. Brothers Peter, Neil, Les & Steve; Sister Ann. Capped for England over 50 times! No.4 of the five Collins brothers, ahead of Steve and behind Peter, Les and Neil. A tough act to follow, but Flyer Phil stepped into the role with some style. Signed from Ellesmere Port by Dan McCormick in 1978, for a then record fee of £15,000 (ukp). 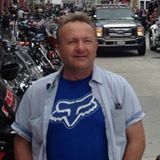 He then stayed with the Heathens for a further eight seasons before quitting British Speedway to head for the USA. Never rose to the individual heights of Peter or even Les, but still achieved a great deal. 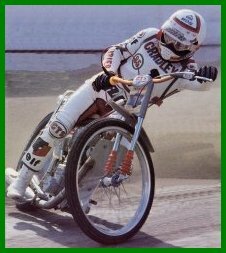 Was in the highly successful Cradley teams of the early eighties and for much of that time, formed a fantastic partnership with fellow England international, Alan Grahame. 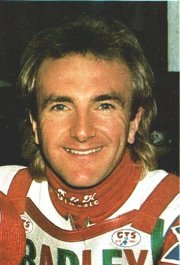 Regularly represented the Lions at Test and World Championship level, maintained a heatleader's average at Cradley for some years and achieved some success individually, including an Overseas Final victory. Phil still lives and works in the USA, now divorced with three daughters in Grover Beach, central California. One of his projects has been acquiring and restoring a 1958 London double decker bus! He had it parked outside the court house in Santa Maria for the Michael Jackson case where he rented it to the press. Copyright: Steve & Phil Johnson 2015.